Taken from a report by the French Anarchist weekly paper Alternative Revolutionaire this short article gives a taste of developements on the ground in the fight against Islamic State. “For several days at the Syrian-Turkish border, the city of Kobanê is besieged by forces of the Islamic State (Daesh). Kobanê is a strategic turning point. If the city falls, the whole of Syrian Kurdistan is threatened, and with it a political and social model, that of "democratic autonomy" and "democratic confederalism" built since July 2012. More than 100,000 inhabitants and residents have become refugees on Turkish territory. The city is defended by the People’s Protection Units (YPG), militias linked to the PKK, and in which alongside the majority of Kurdish fighters, are also Arabs, Turks, Muslims, Yazidis, Christians or atheists, united against the fanatics of Daesh/ISIS. Thousands of young people, socialists, trade unionists, revolutionaries, feminists, libertarians have poured in from all over Turkey to Kobanê. They go there to support the refugees and defend the city. Despite the blockades of the Turkish army, hundreds of activists and militants have managed to cross the border. 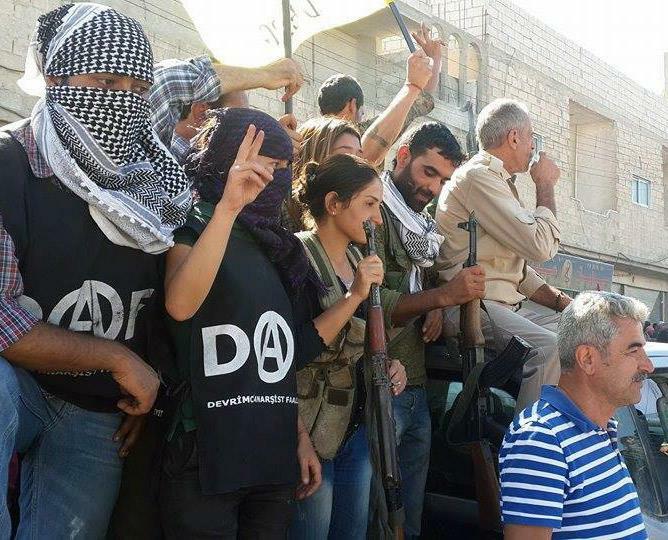 Among them, the comrades of the Revolutionary Anarchist Action Group, who made the trip to Istanbul to join the defence of Kobanê. Its hard getting update news for today on whats happening on the ground - a few reports have trickled in from Ireland and other places....any updates posted here would be great. This is rather disgraceful though not really surprising. On Twitter there was a swedish journalist @joakim_medin in Kobane. Now over the border in Turkey. @Hest_ebooks has also been providing some updates via retweets. Defending human lives is brave and admirable, though I'm not sure why anarchists should risk their lives to defend "democratic autonomy" and "democratic confederalism" as implied in this piece. Tyrion would you mind explaining your position a little further? Are you suggesting that Anarchists should only act when their direct interests, their type of politics, and their world view in itself is directly attacked? I fail to see what the hesitation to defend an area/region form a militarized reactionary force that wants to institute an order that would surely go to dangerous levels of violence enacting their world view at the price of anyone who does not fit within what is deemed as tolerable. But why? I fail to see why people in that region, anarchists and other leftists who have chosen to fight against ISIS, would be better off setting up help centers for refugees, taking a passive position rather than active defense? Are you talking about the PKK or the Da'esh? OK, it just could have applied to both of them. The question is not fighting against ISIS BUT fighting FOR PKK. There are no civilians left in Kobane and the fight today is only serving to specific organizations: PKK and ISIS. Why should any genuine internationalist should sacrifice herself for this counter-revolutionary massacre? If ISIS is reactionary than PKK is also reactionary, and in my opinion PKK is still continuing the fight mainly because, first it wants to draw the attention and appreciation of western secular public scared by the ISIS terror, and second to show its fighting capacity to the NATO states which can potentially see in PKK a potential ally. To really fight against ISIS, revolutionary internationalists have to reach its popular base; in middle east this is sunni arabs and other sunni groups. But overall, we need to find better methods and theories to understand the contemporary nihilism and its roots giving birth to those crazy ideologies and gangs. Make no mistake; nihilist suicidal anti-humanism is neither a product of Islam nor Middle East, even though it is more clearly and violently expressed in Iraq and Syria today. Just remember Brievik and his murderous attach in Norway in 2011. Nihilism is a widespread and dangerous tendency and to kill it we need more serious preparation, endurance, and time than it takes to destroy its one particular expression: ISIS. One note about PKK and secularism: I see people like David Greaber sharing women guerrilla pictures fighting on the side of PKK as if it is a proof that PKK is the guarantee of women's liberation against islamist reaction in the region. You have to see that this is a shameless pr campaign that mystifies the truth. It is true that many women are joining the PKK from especially lower class sections of Kurds in Turkey. However, Kurds in Turkey tend to be more conservative and religious than Turks (on avarage) and Kurdish women are even more oppressed in Kurdish families. Forced marriage at a young age is a common problem in North Kurdistan (Kurdistan in Turkey). Under those circumstances joining PKK is a way of escape, since once armed women get to earn respect and if they are lucky they can rise in the organizational apparatus. In one sense, just as the way ISIS exploits the material degradation of sunni-arabs, PKK exploits the Kurdish proletarian women's harsh conditions. But neither of them propose any solution to those material problems - they both capitalize on poverty and oppression of particular groups (sunnis, arabs, women, etc) and do nothing to resolve that; it is basically like a form of military-pirimitive accumulation. Kobane seems to form part of the Western Kurdistan mentioned here. Which puts the lie to the presentation of events there. As has been said above, for anarchists to head over there is not a bright idea. Hopefully they won't get themselves killed for nothing. In terms of active defence, what are you actively defending? West Kurdistan which has basically signed a cynical pact with Assad? The city itself? The people of the city? The idea of democracy? Is there nothing more to be said about PKK, YPG, DAF, and clearly seemingly anarchists and autonomous groupings and tendencies going to the region to fight against ISIS? Is it just that easy to brush aside groups in the area fighting against ISIS (which is, for this region, an extremely dangerous and reactionary group likened to the extreme rightwing in the west and christian fanatics in the US and Norway) and just explain away their movements, political developments, ideology, and actions are mere opportunism. Does this not, to a point, then make everyone and any political group an opportunist? Anarchists are going to the region only to score political points...I am thinking there could be more to this than just political opportunism. I am having a hard time seeing that the PKK or YPG's feminism is just strategic opportunism and not an actual reaction and struggle against sexism in the region. An armed group that is supported or part of a party that seems to have a feminist analysis seems to be ahead of the west where women appear to be token soldiers within a male dominated group. I just see there being more to this than just opportunism, depending on how opportunism is understood. I admit I am not from the area nor am I clued in as to the daily experiences...I do draw a conclusion that this situation and the involvement of autonomous democratic kurdish forces, kurdish and turkish leftists, etc...is a popular rising against extreme reactionary forces. I would like to liken this to western actions against the extreme right, religious rightwing, etc..- but militarized. Just one small example from the past about PKKs role in the region: about 7-8 years ago (If I remember correctly) the Turkish government organized a military operation in Iraq against the PKK. It was a usual thing back than. Turkish state had a habit of barbarically raiding Northern Iraq to instill fear. The Turkish left was silent and the Kurdish left could only raise its voice mainly in Northern Kurdistan. Back then we (EKS) prepared an internationalist leaflet protesting this action and distributed it in a several universities in Ankara. For us it was an important thing to at least show that you could condemn Turkish imperialism without necessarily supporting Kurdish nationalism. Obviously the main target of the leaflet was the Turkish state and the Turkish government. But we included a short but principled criticism of PKK; ONE line criticizing the cynical role of BDPs MPs. Only ONE. Today all revolutionaries faces those conditions in Turkey; if you criticize PKK and the Turkish state from an internationalist point of view, you not only face isolation, insults, and threats but physical attacks or "legal" harassment as well. That is why you can't possibly hear any opposing voice from Turkey... All those voices would be morally and personally condemned, publicly humiliated, labelled as "fascists" - by both Turkish and Kurdish sides!... PKK now enjoys a total success, a success it shares with the Turkish state, in completely isolating any possible criticism against nationalism, any possible defense of workers' class interests. In that sense, it is not only opportunism to fight with PKK, but also a timid approval of nationalism (be it Turkish or Kurdish - does not really matter) over independent working class struggle. Those who support PKK should at least think twice when criticizing Cheka methods or state capitalism in general, otherwise they would fall into an anachronistic contradiction. Interesting input. I am wondering if there is any similarities or differences between the Kurdish PKK nationalism and IRA nationalism. What does the support for the PKK or YPG look like in the Kurdish areas. From reading about it, it looks to be a large political and militant force in Kurdistan. So the EKS views the PKK And the Turkish state as two military powers supporting two different political and economic positions that are in opposition to one another and less like a Kurdish struggle for national liberation similar to Palestine, Ireland, and Chiapas (more in line with anarchist internationalist politics then the others though no less important)? And also what about the seemingly anarchist and leftist feminists going to fight against ISIS? There is no easy answer to that. Turkey has an extremely macho culture. The state, unions, and major political parties defend the continuation of most primitive patriarchal institutions. With the rise of AKP, daily violence towards women increased exponentially in a most grotesque form. That is why it is not difficult to understand especially those educated working class women's disgust and fear from political islam. In fact this is a main trend in Turkish politics: for instance, when AKP first came to power in 2002 there were "Flag Demonstrations" (headed mainly by secular nationalist kemalists) capitalizing on this, and older generation of educated women (working mainly in civil service and education sectors) headed those, fearing that islamists would exclude the women from the public life. I think the particular structure of Turkish capitalism is the main cause of this strong patriarchal dominance. Turkish economy did relatively well for different reasons for the last decade. However, its "growth" hardly benefited working class/poor women. On the contrary, they remained at home, and carried the heaviest burden of the so-called economic recovery. Today women unemployment is about 70 to 75% of the total women labor force. However, this does not make any logical sense, since productivity of women labor has tremendously increased, when compared to the previous decades. There are more educated women and they are more openly willing to find jobs in the market. But the regime is politically benefiting from women's exclusion from the labor force, since it arbitrarily relieves the pressure on the men who are trying to find jobs. And to preserve this regime, women are more and more oppressed, subjected to a very severe form of domestic violence. It is almost like a form of primitive accumulation; by systematically destroying proletarian women psychologically and spiritually capitalist accumulation system preserves its political stability. In that sense, anarchist or feminist women's hatred of ISIS -a horrible gang that exaggerates already existing patriarchal traditions in the region- is very understandable. EKS dissolved and the majority of its former member are currently in the ICC. However, I think all members of the former EKS would agree that PKK (even though it rejects the so-called rights of nations to self-determination now) is a Kurdish nationalist organization, similar to PLO, IRA, or EZLN. At the time we all thought that these were anti-working class organizations - and I still think the same. From reading about it, it looks to be a large political and militant force in Kurdistan. This is true. Usually, in most of the Kurdish regions PKK's legal wing receives about 50-60% of the votes in the elections, and the rest goes to the islamist AKP. However, what is interesting is, poor and working class Kurdish women tend to vote proportionately more for AKP than Kurdish nationalism. And there is an easy explanation for that: over the years AKP built a huge charity network in order to support the Kurdish patriarchal institutions. They regularly distribute coal, food, clothes to... families. Much as I see how problematic it is, anarchists being involved with the PKK, I don't think we should perceive the actions of these young comrades too negatively. Rightly or wrongly, it is entirely understandable that feminists would want to fight the ultra misoginist ISIL and that anarchists would also want to fight this ultra conservative quasi-fascist gang of psychopaths. If the leftist PKK is the only viable means of doing this and if they're not buying into the whole nationalist schtick, then I wouldn't be too harsh in my criticism. OK, it's not Spain 1936 and there is no revolution, but I would still tend towards generosity in viewing their actions. Mind you, I do worry for them as they are placing themselves in a dire situation. mikail provides some background to support Serge's plea for a generous approach towards the move of some Turkish anarchists and feminists to join the Kurdish KPG military fight against ISIS but is their action ruled more by an understandable emotional response to human suffering close by (rather than much similar suffering further afield) than inteligence, and a misplaced trust in the liberatory value of recent democratic developments in Syrian Kurdistan? Moreover what practical benefit is this action to those remaining in Kobane, by what I assume to be a very small politically motivated Turkish group? The political argument between mikail and ocelot on the other related thread comes to mind here also. Were Syrian Kurds in general in Koban right to stand and fight to defend their homes (whether they actually owned them or not) alongside the existing Kurdish political-military apparatus (that have their own seperate motives) rather than flee to Turkey, given that if they stayed they faced on the one hand ethnic cleansing and likely death in defeat and on the other if they fleed, ethnic cleansing and a life of sorts in exile!! Surely a practical matter in difficult circumstances not of their choosing, which only those Kurdish people on the ground could reasonably assess and decide rather than a matter of theoretical debate over 'abstract rights' and political principles we are in no position here to apply? As it happens though most it seemed decided best to flee! whilst others sought to cross the border in the opposite direction moitvated by a different assessment and presumably diferent motives? A lot of questions not sure about some of the answers. What part of it is a lie exactly? Are you referring to the 'experiment' collapsing due to the area falling to IS? West Kurdistan which has basically signed a cynical pact with Assad? As concerns the 'deployment' of Istanbul anarchists to Rojava, and indeed the growing number of anarchists across the world calling for the West to arm the Kurds (yes, really), I think people are correct to say that this is hot-headedness caused by high-running emotions, but I think there's another element here which needs to be teased out, which is the necessity to break with the ridiculous dichotomies that are presented by Western govts via the media outlets. Faced with this false choice, it seems that many people have chosen what they consider to be the most reasonable (which includes mobilising to suffer a gruesome, public execution), but a more productive approach might be to reject the entire premise of the question - one that has been manipulated and pitched by a disingenuous and dishonest international ruling class, after all - and instead engage in some soul-searching and discourse on what can be done. My response to the facile question of "Well what do you suggest?" would probably be "Well, anything other than bombing them or dying in a foreign country. Let's start from there." I've found it difficult to relate to the unfolding tragedy of Kobane (not unique in the world, I know) other than in a predominantly emotional way. I appreciate Spiky's and Serge's more nuanced attempt to understand motivations beyond an abstract and principled, rational dismissal of all sides as equally bad. I just feel that those about to face the scimitar and the knife of triumphant takfiri - whether they chose to fight or were unable to get away in time (sometimes through infirmity) aren't well-served by cut-out-and-keep proletarian internationalist prescriptions of universal applicability. I keep thinking back to the heartbreaking picture of a man with Down's Syndrome, looking confused, being led by the hand across the border to Turkey by his elderly mother... I wonder what sort of future awaits them, driven from their home. For this reason alone (rather than any romantic attachments to the fiction of 'oppressed nations' deprived of a 'homeland') Mikail's prescription to people to run away "it is not their land" angered me. [Mikail, you don't have to respond to this by saying how bad you feel for the victims, I'm sure you do, I believe that]. No, I haven't got any answers. Only the utmost admiration for brave - if 'misguided' - people, facing those who I can't feel anything but the utmost hatred for. No I am not going to say that; I am just going to say this: Originally most of the Rojava Kurds were forced to migrate to Rojava from Turkey and Iraq by the state(s). That is why Essad regime never recognized them as "citizens" and that is why they could not get any Syrian ID .. Home? There is a turkish saying: "Home is the place that you are fed and protected". The duty now is to enter into solidarity with the Kurdish proles who fled to Turkey, to make sure that as long as they stay this is their home. I think Mikail's comments about it not being their land have been really badly misinterpreted. He quite obviously meant that is not their country as in they don't own it, and they have no interest in dying on behalf of the people who are the owners, not it's not their land they should get off it now. Thanks Devrim; I meant land in the capital "L" implying the nation. I thought the connotation was clear. Of course all the Kurds in Rojava has a right to their land, in no way I am trying to deny that. Their homes and cities are rightfully theirs. Who can argue against that? However, I am just trying to say that no "Country" worth the life of a single proletarian. That is all. If the proletarian Kobane Kurds are in Turkey today, they rightfully own the land wherever they stand in Turkey, together with all the other proletarians in Turkey. Just because their homes were in Kobane before the civil war, does not mean that they are eternally bound to that place and they should either die there defending it or live as slaves in Turkey just because they want to survive. I may be mistaken but I am picking up a hint of anti-militarism that goes beyond state or quasi-state like institutions and organizations and is being further applied to fighting groups of people. This type of anti-militarism and pacifism seems to also suggest that a better option for people is to simply flee from the region or area in which a theistic ultra-conservative armed organization and social movement is taking over. I apologize if my assumptions of pacifism and anti-militarism are incorrect regarding this conversation. From the conversation I am able to see a likeness in comparing the PKK to the PLO, organizations that fulfill a certain role of governance likened to that of traditional nation-state governments. Though I am confused about the statement that the IRA, EZLN, and say the PFLP are not working-class organizations. Now having said that, I do understand the point that the organizations themselves may not carry a true work-class socialist/anarchist/communist perspective and act out solely based on that perspective. Though I have a hard time understanding the need for such a hard political/theoretical line to be drawn in this case about leftists fighting ISIS and I find it harder to argue such a hard line when discussing the IRA (its various formations), EZLN, and the PFLP. I do understand that these groups are not purely anarchistic but I still fail to see the importance of such a purist political line. (even in Spain 1936-39 or even the Bolshevik revolution the most popular and strongest anarchists or communist tendencies/grops/orgs/fighting forces that represented the "true" working-class perspective were still denied the ability to do something entirely on their own. Cooperation and coordination as still required during those times. I do not simply agree, even as an anarchist, that not reacting unless it the reasons to react and what would be in reaction to could only be anarchistic or purely working-class in itself. I think those perspectives certainly guide why something is happening; but even so in 2014 the term and category working-class is so broad yet the perspective is not. I see a likeness to fighting ISIS as I see in fighting fascism, ultra-conservatives, and christian fanatics in the West. Sure it is not necessarily a purely working-class activity for liberation from capitalism but all the theoretical justifications for fighting the right in the west seem to apply to fighting ISIS. The same goes for building up a working-class movement, if it is weak and extreme-reactionaries are able to take over then the working-class movement has already failed itself (so stated b Dauve). Also, the same reasons why allies and cooperation between different groups exists seems to apply to the situation of fighting along side or with or in groups that are opposing such things. Anarchists tend to join other groups or ally themselves with such groups when there is a lacking anarchist/leftist group or movement to par take in because despite our theoretical conclusions and analysis the material world is still very much happening. I still view the actions or attempts of DAF as very relevant and I support people making the individual decision to fight within the YPG or other left-leaning and left-nationalists fighting forces. Though such a conclusion does not square completely with anarchist principals-hose are just principals. I also see these various secular and non-western democratic/pro-capitalists alternatives to fighting ISIS (and views like it) as a welcoming thing onto the world stage- finally there is not a monopoly on criticizing fanatical Islam. The world can no longer simply be divided up between the West and Islam. Marx-Trek, there is so much I disagree with in your last message, I really wouldn't know where to start. I support mikhail's position and reflect the concern that some comrades above have in respect of Turkish anarchists fighting the advance of Isis alongside the nationalist PKK, a group, while not on the scale of Isis, has committed its own atrocities. This follows the so-called "Syrian anarchists", publicized by some on libcom, calling on workers to fight alongside the nationalist, US-backed Free Syrian Army, for a Syrian "revolution" that never even began and the AWU Ukrainian anarchists that supported democracy and Ukrainian imperialism. Ocelot, on the ISIS thread, has supported this involvement in imperialist war under the need to fight "against fascism, racism and ethnic cleansing". The feeling to want to fight this particular gang of capitalists has been whipped up by the state here in Britain over the murder of an aid worker who was a particularly amiable character in order to support greater western intervention which will necessitate "boots on the ground". This will be yet another "humanitarian" war (forget Afghanistan and Iraq for the moment, just look at Libya) and a further slide into militarism and further instability and massacres. Serge calls Isis ultra-conservative and quasi-fascist, which further reinforces the lure of anti-fascism for imperialist war. Owen Jones in the Guardian today makes the point about the town of Latifya just outside Baghdad:a town of horror and terror; 150,000 fled, summary executions on the street; civilians pulled out of cars and shot in the head; large scale abductions and so on. This is being done by government backed Shia militias showing their own brand of "...racism and ethnic cleansing". This is why so many Sunni civilians have fallen into the embrace of Isis - they see it as the "lesser evil". It goes without saying that I'm not underestimating the particular brutality of Isis - see link below. It's brutality is one of its biggest selling points to the "international brigade" of jihadis that are flocking to the group - young women as well as young men. Isis hasn't fallen out of the sky or just a group of "evil psychopaths". It is a construction of imperialism from the major imperialisms who fed it both directly and indirectly and the local imperialist states, Iran, Turkey, UAE, Saudi Arabia, Qatar and Kuwait. And if you're response is based on an "atrocity scale" then look no further than the armies of the US and Britain for a historical top billing. But the anti-fascist lure is always accompanied by the defense of democracy and nationalism. Though Serge's post about ISIS being ultra-conservative and mine my differ. But on that point, I do not agree that looking and giving some rhetorical support to groups in the area fighting against ISIS as an "anti-fascist support for imperialist war". I think that is too broad a brush to be painting with. Serge try. Perhaps you dont agree with me on about the purist-anarchist critique? Though this discussion now seems moot since it is now being reported by Ireland WSA that ISIS has all but taken Kobane and the fighters against ISIS have resorted to suicide attacks. And from those reports the Turkish forces seem to have waited till the last moment prior to guarding Turkish interests on the backs of Kurds.